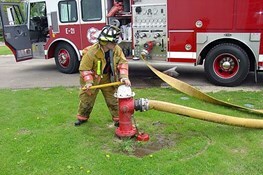 North Ridgeville Fire Department flushes fire hydrants throughout the city each year from June through the end of August and on an as needed basis. Flushing fire hydrants ensures that they are operating properly and have sufficient pressure for fire suppression. Also, it flushes sediment out of the water mains.